Ever since the early harvest a few weeks ago I have been eating peaches with abandon. Having plump, sweet, tangy, drip-down-your-arm peaches is truly one of the greatest feelings in life. I am probably averaging 2-3 large peaches a day (not sorry) either in my oatmeal, smoothies, with black-strap molasses, or sliced on their own. The other day I found another great way to get these juicy giants into my belly, in a salad! When I eat salads I like having hearty bowls that are their own meals, so instead of just having greens with some fruit and nuts I decided to add some grains (technically seeds) that I already had cooked in my fridge. 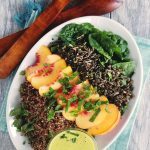 The combination of spinach, wild rice, red quinoa, and juicy peaches was not only visually stunning but delectable. 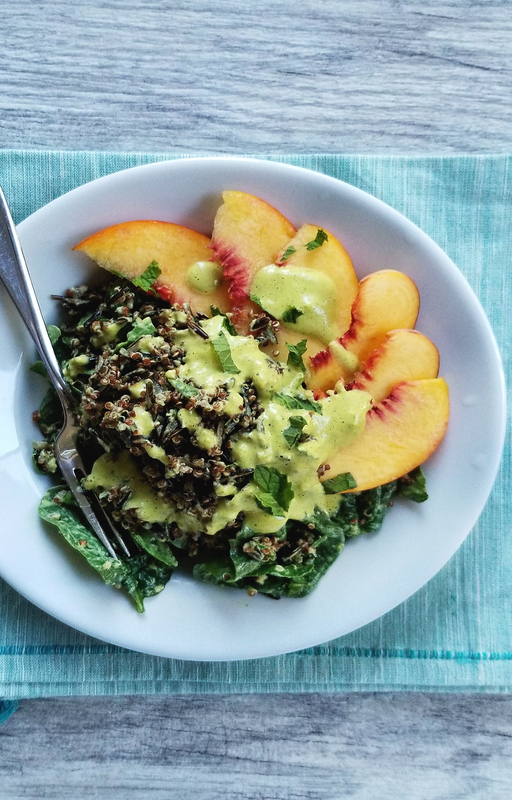 To counter the sweetness of the peaches I whipped up a pungent dressing with all kinds of different mustard’s blended with hemp seeds. The result, a gorgeous salad that screams of summer and makes you feel good. 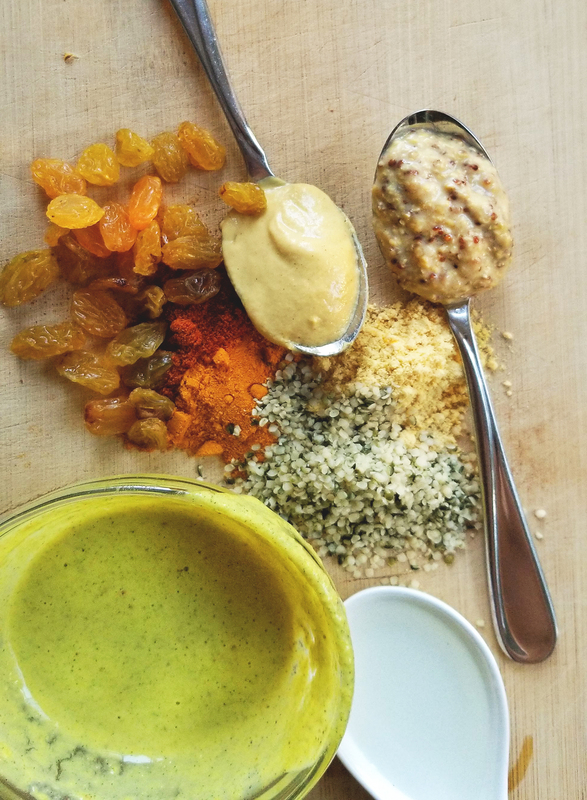 I have adjusted the dressing recipe since that day; adding in a few springs of fresh dill, golden raisins instead of maple syrup, and a pinch of turmeric for an extra boost of color and antioxidants. Leafy Greens packed iron, calcium, protein, fiber & antioxidants. 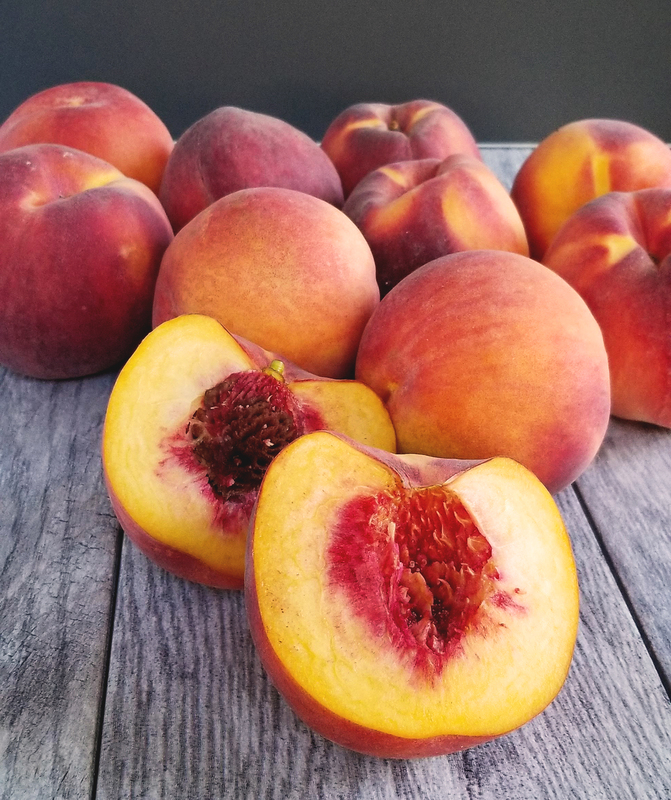 Fruit like peaches(you could easily use nectarines or plums) are packed with vitamin c, potassium & fiber. Seeds like wild rice and quinoa are loaded with minerals, vitamins, and a great source of protein and fiber. Whole plant fats from the hemp seeds are a great source of omega 3 fatty acids, protein, and fiber. Spices like mustard seed, paprika, and turmeric are great antioxidants and bring gorgeous color to this dish. Herbs like dill and fresh mint round out this salad with a pop of freshness and even more color! You can make the dressing the day before and the color will intensify the longer it sits. Prep ahead of time for an easy to make salad anytime. Enjoy! A gorgeous tribute to summers' greatest stone-fruit! 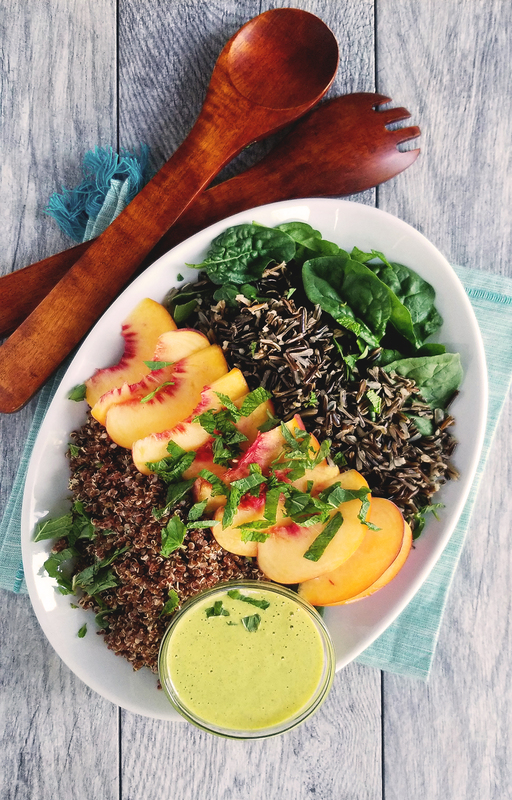 Juicy peaches, nutty wild rice, protein rich quinoa, and crisp spinach meld with a bright & creamy mustard dressing. A great meal to throw together when you have leftover grains in the fridge. Place 1 c. wild rice & 3 c. water and a pinch of salt in a saucepan with a lid over medium-high heat. Bring it to a boil. Turn the heat down to low and let is simmer for 40-45 minutes. You will know that it is cooked when some of the kernels burst open. Drain excess liquid and store in refrigerator to cool. This will yield 3-4 cups of cooked rice. In a small blender (like a magic bullet) or food processor add in all ingredients for the dressing. Blend on high until a creamy consistency is reached. You may have to shake or scrape down the sides a few times. This will yield about 1 cup of dressing. 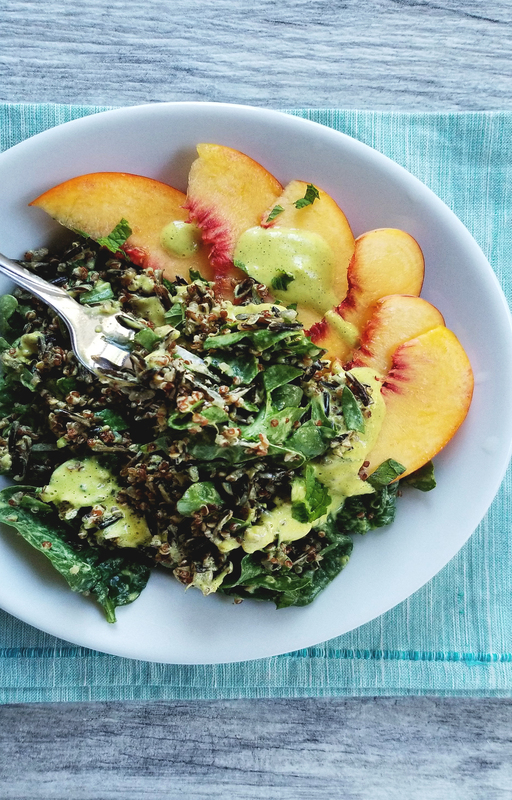 In a large bowl mix the spinach, quinoa, and wild rice with as mush dressing as you would like. Toss to coat then slice the peaches and place on top of the salad, adding more dressing if you'd like. Top with fresh mint and enjoy!